Have you ever wondered what a multi-million-dollar carpet looks like? 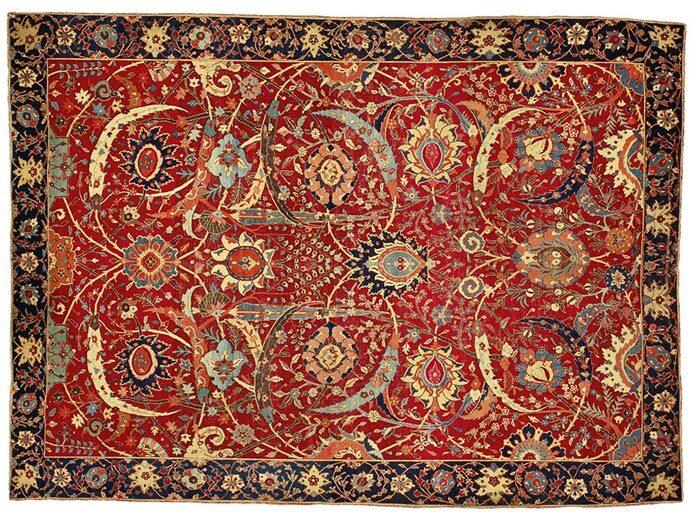 Whether it’s due to the pure opulence of their materials, their provenance and history, or the rarity of these antique carpets, they have all fetched a fortune at auction. The Sickle-Leaf Persian rug is a seventeenth-century Persian rug. It sold for a staggering $33,8 million (R449,5 million) at auction in 2013 – three times more than the previous auction record set for the sale of a carpet. The rug originates from Kerman in Iran, and is one of the rarest vase-patterned rugs from the region. Kerman “vase” carpets typically feature flowers and oversized palmettes, with a vase motif repeated throughout the design. 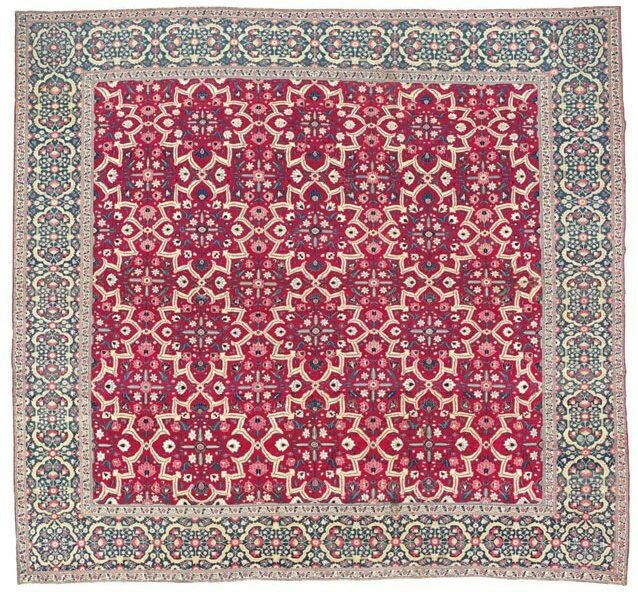 This particular vase rug is extremely valuable because it’s possibly the only remaining carpet of its kind with a red background. 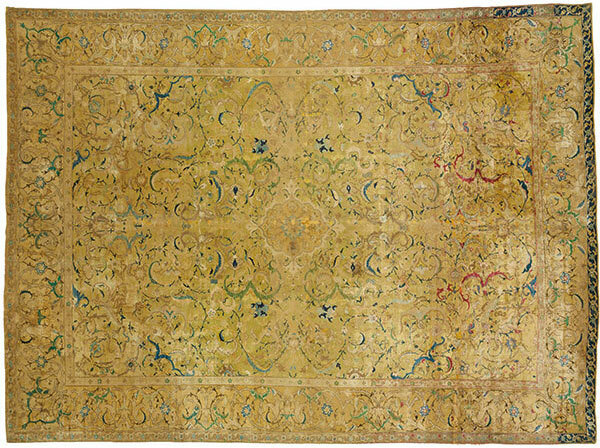 This mid-seventeenth-century wool carpet sold for a cool $9,6 million (R127,7 million) in 2010. This vase carpet is said to be an excellent example of the craftsmanship that went into carpet weaving in Kerman in the sixteenth and seventeenth centuries. The carpet is also one of the earliest of its kind to feature a prototype of the popular “Herati” pattern, which is a design characterised by a flower centred inside a diamond. 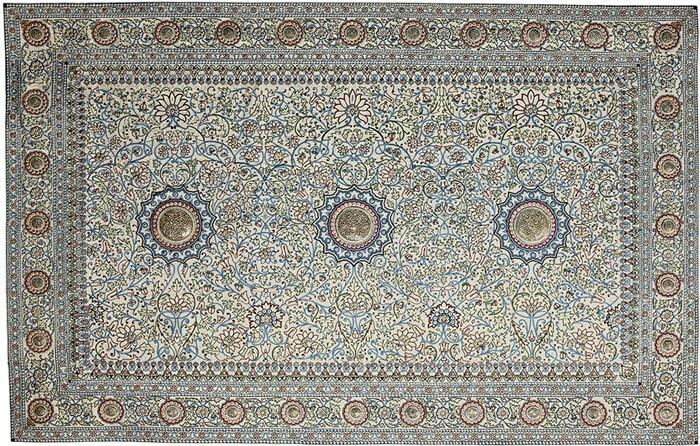 The Mughal Star Lattice carpet is a fine cashmere wool carpet that originates from Kashmir in India. It is one of only 12 remaining millefleur (French for “thousand flowers”) star lattice carpets from the Mughal era. 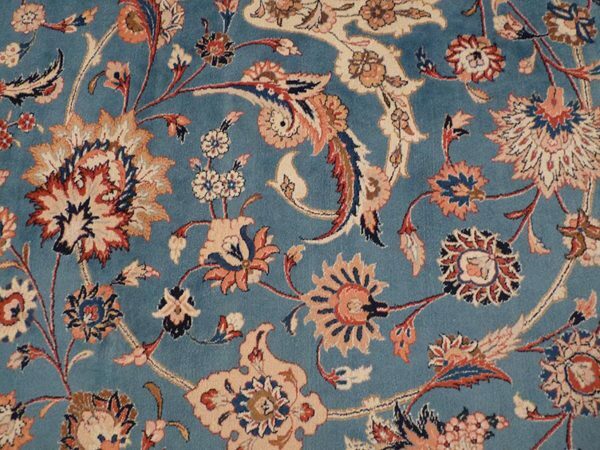 The beautifully crafted carpet was woven during the seventeenth or eighteenth century, when the millefleur design was popular with Mughal nobility. The carpet was sold for $7,7 million (R102,4 million) at auction in 2013. This eighteenth century French carpet sold for $5,7 million (R75,8 million) at auction in 2000. The carpet was the last of three designed by Pierre-Josse Perrot for the royal residencies in France. 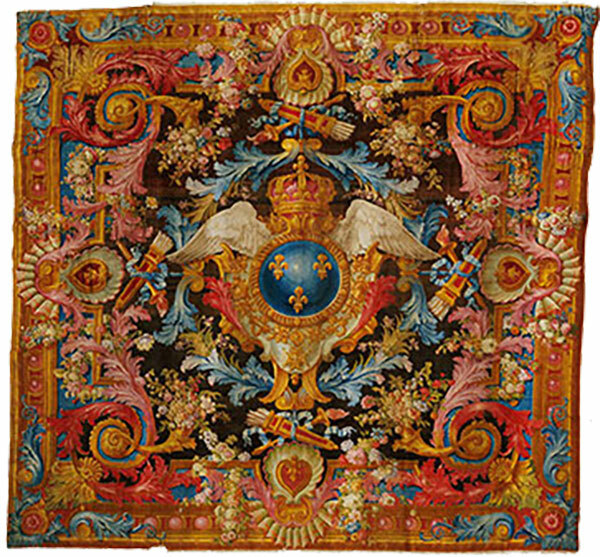 The carpet was woven at La Savonnerie, a weaving workshop that was set up in Paris in the mid-seventeenth century to produce carpets and woven upholstery for the royal court. 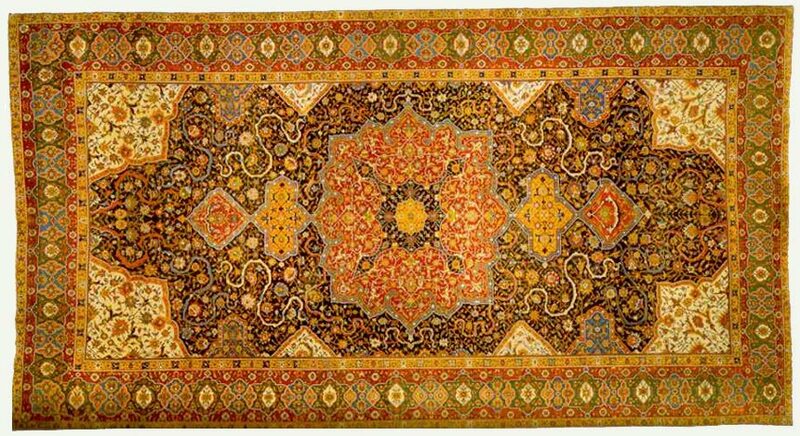 This Persian rug sold for $5,5 million (R73,2 million) at auction in 2009. Commissioned by the Maharajah of Baroda in the seventeenth century, it is made from silk and deer hide, and is embellished with about two million pearls, English glass beads, and gold-set diamonds, rubies, emeralds and sapphires. The carpet was created for the tomb of the prophet Mohammed, but did not reach its destination before the death of the Maharajah. Instead it remained with the Maharajah’s family. 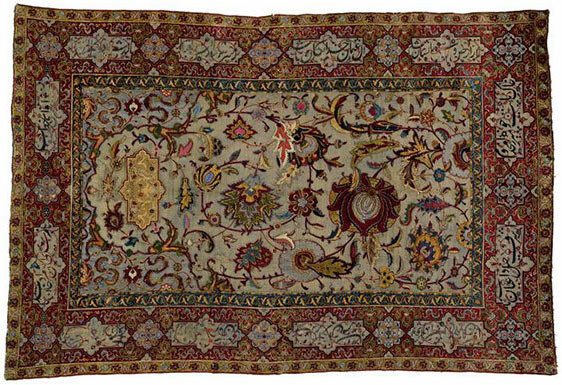 This rug, which previously belonged to tobacco heiress Doris Duke, fetched $4,45 million (R59,2 million) at auction in 2008. Made of pure silk, it was woven in Persia in the early seventeenth century. The rug is a stunning example of Safavid art from the reign of Shah Abba. It was donated to The Newport Restoration Foundation upon Doris Duke’s death in 1990. The Safavid prayer rug is a rare wool, silk and metal thread prayer rug that was woven between 1575 and 1625. The rug is inscribed with Persian verses, the content of which suggest that it was a gift from the Persian Safavid court to the Ottoman Turks. The rarity and astonishingly good condition of the carpet led it to sell at auction for $4,3 million (R57,2 million) in 2009 – 20 times the pre-sale estimate. This sixteenth-century Tabriz rug originates from the Azerbaijan/Iranian city of Tabriz, one of the oldest carpet weaving centres in the world. The carpet is claimed to have been looted from the Austrian branch of the Rothschild Family by the Nazis during World War II. In 2008, Sheikh al-Thani of Qatar bought the antique carpet at auction for $2,4 million (R31,9 million) – a sum that far exceeded its estimated worth of $400 000 (R5,32 million). 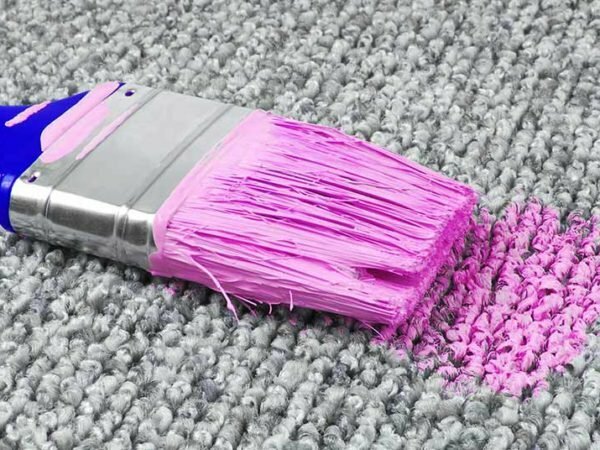 At Chelsea Cleaning, we specialise in cleaning all types of carpets and loose rugs, including Persian and oriental carpets. 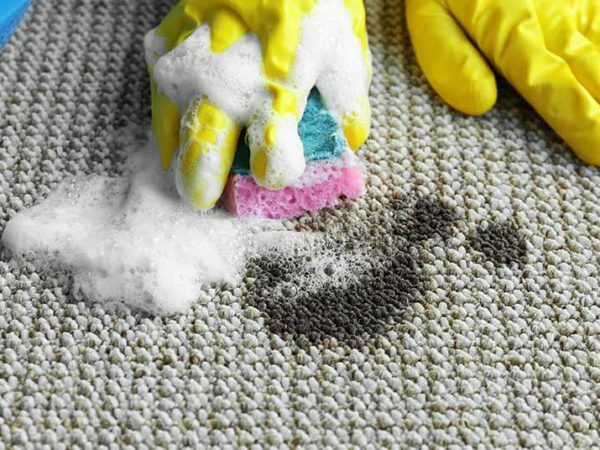 Contact us for carpet cleaning in Cape Town.